﻿ Why is ELO boosting so expensive? How cost of elo boost is formed and why prices can seem high at first sight? People who try to get LoL elo boost are often surprised with prices they see. For example the cost of boost from bronze to gold vary from 120 to 200 euro depending on the elo pushing service while cost of an elo boost to diamond can easily exceed 500 euro. They should be Diamond 1 or higher to confidently complete orders they receive on any ELO while only 0,01% percent of all players (one of thousand) fit this requirement, source. We care about safety of our customers accounts thus we hire only people who weren’t suspended due to disrespectful behaviour. We check it by honor amount on the account confirmation stage (honor is reset to 0-0-0-0 at themoment of suspension and we don’t recruit people who has low honor amount). Future booster should be able to play 6-10 hours per day on regular basis to be able to elo push one division per day. Not everyone who fits requirements above would try to become an elo booster. 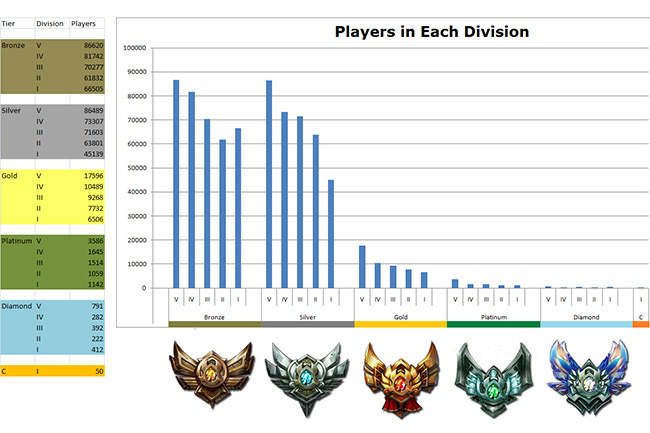 Season 3 players split by leagues. Old data but still pretty demonstrative, fresh statistics you can check by clicking source above. This narrows the range of players that are able to complete job on quality level and thus can be recurited hardly. Except the fact that only a few LoL players can do such job they should spend time equal to working hours at usual job. Labor of a person who is capable of doing job only few are able to do and spends time equal to any other full-time job should be paid accordingly. Dont’t forget to take elo boosting service spendings on website development, support and promotion into account. However we are keeping our prices nearly by 20% cheaper than most major services do and announce various promotions which bring discounts on different services regularly. Diamond league is unreachable for most people. Yeah, Elo boosting costs some money. But still I think that Elo boosting is just necessary for people like me – skins collectors whos skill got stuck somewhere on average. Every time when the Riot highlight a new Victorious skin and I still do not have Gold , I’m so upsetting. But I still have to admit that the boosteria have rather pleasant prices, and the discounts that appear make my wallet sigh with relief. And the loyalty program is really nice thing, that causes a smile at my Scrooge Mcduck’s face. And why all companies can not set their prices to the same level as Boosteria has? I really love their prices for Elo boosting services and i will devinitely order boost for gold in season 8! We will make a promo discount when season 8 start! Well elo boost prices went down in the recent years. Good for us i think. Maybe will get to the platinum this way this year if won’t be able to do that by myself.